12 archaic Slavic holidays from Osenin to Golovosek, the full range of human emotions, dance styles from tango to hopak, shaking the periodic table, chemical elements from Helium to Unbibium and unnamed in a new production of the theatre «Provincial dances» directed by the Engineering Theatre AKHE. This performance is based on the well-known story of D.Mendeleev, who after many years of work saw a table of chemical elements in a dream. Everything that happens on the stage is a dream and reality. Sometimes the dancers look as restless unruly molecules, and as people who love, suffering and experiencing the other gamut of emotions. The performance genre is specified as «free-style reconstruction of scientific insights». The music for this performance is written by the famous composer Nikolai Sudnik. The Author of choreography is Tatiana Baganova. Lighting design is created by Vadim Gololobov (Engineering Theatre AKHE). The role of Mendeleev is performed by Vladislav Bobrovich, a deputyof the «Provincial Dances» theatre director and a ballet dancer in the past. 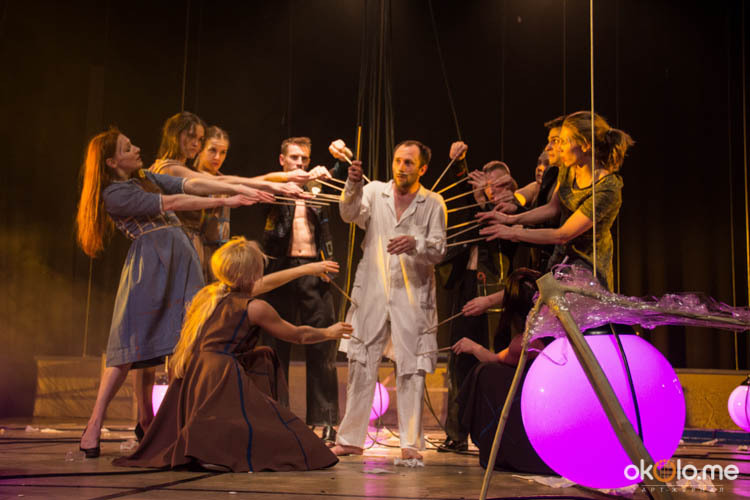 This performance is nominated for the Russian Performing Arts Festival and National Theatre Awards «GOLDEN MASK 2016» as «CONTEMPORARY DANCE/BEST PRODUCTION».